A regular read of mine, The Neighborhood, has had a couple great posts about biking this month – you know, it being national bike month and all. I figured with all the biking i’m doing, i’d share this rad post about keeping that bike in working condition! Happy National Bike Month! Did you even know there was such a thing? Well your ears do not deceive you: this month is National Bike Month, and it’s time to get riding. Usually observers celebrate by breaking out the rusty two-wheeler and plunking along to work instead of driving, and if you are like me, that bike may need some major TLC. Other bike lovers are hitting the roads and mountains for some great road biking or trail riding. 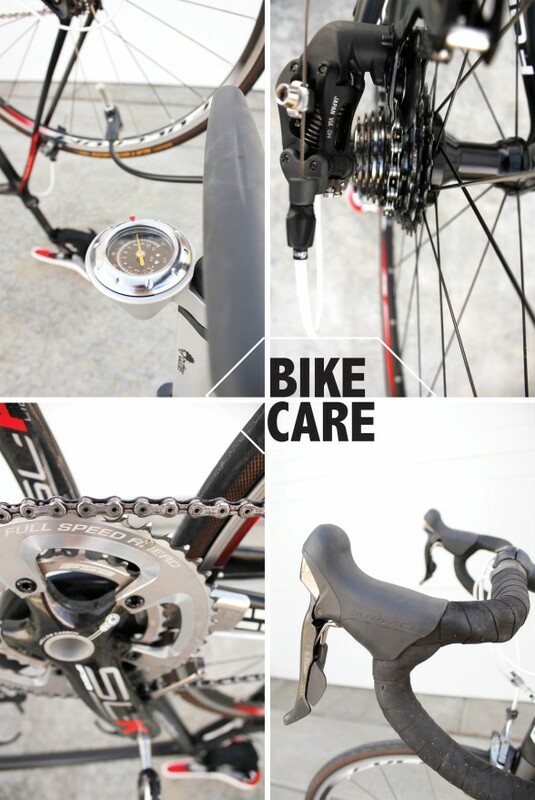 Regardless of the type of bike you peddle (be it a road bike, a mountain bike, or even a beach cruiser), these bike maintenance tips prove to be a great way to get you bicycle in shape and keep it in shape. 1. Pump, pump, pump it up! Your tires should be inflated to the proper psi (pounds per square inch) every time you ride. For road bikes the typical psi is between 80 and 130. Mountain bike tires require between 30 and 50 psi and hybrid tires 50 and 70 psi. Keep in mind the heavier you are, the higher the pressure needs to be (within the recommended pressures still). Now, there is some debate among cyclists regarding the best type of lubrication to use for chains and sprockets (some dispute over fluid vs. dry oil). But there are two things they seem to agree on: 1) chains and sprockets need to be maintained with some kind of lubricant, and 2) make sure that chain is very, very clean before oiling. I suggest further researching which type of oil and technique is best for your bike. Bikes, depending on the amount of use, need annual doctor visits too. Take your sweet ride to the local bike shop for a tune-up once a year. There they will check on your bike’s cables and break pads and make sure it is functioning on all sprockets, if you will. And, most importantly, they’ll make sure it’s in top shape to celebrate National Bike Month!